No matter how much automation technology you have, your warehouse is virtually useless without your employees. Dedication to keeping them safe and injury-free is the key to a successful, productive warehouse. Below are some incidents to plan for and prevention tips to help guide your vital warehouse safety procedures. It is estimated that each month, an average of two warehouse workers die on the job after being crushed by heavy machinery. Serious and fatal accidents often occur once employees become comfortable and complacent while operating large pieces of equipment. Though it’s good for forklift operators to know and understand their machines, they should always remain vigilant and aware of their power. Prevention: Review possible hazards of operating a forklift and other heavy machinery often and always encourage employees to remain cautious to avoid accidents. 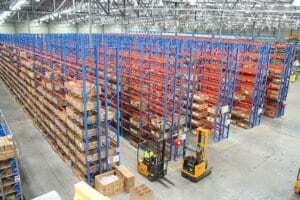 Stacking products high is a great way to effectively utilize space in your warehouse. However, it can also create dangerous hazards in the form of falling product if not stacked properly. Whether it’s carelessly stored merchandise or odd shaped product, it’s important to stack correctly! Prevention: The heavier the load, the more care required when stacking. Pay special attention to cylindrical objects, which can easily roll off shelves and cause serious injury. Slips, trips and falls constitute the majority of general industry accidents. It is estimated that they cause 15% of all accidental deaths, and are second only to motor vehicles as a cause of fatalities. 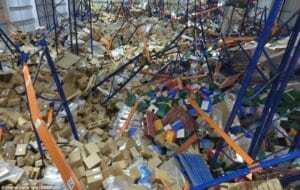 Pallet rack collapses are often the result of attempts to improperly stock product. Even when storing smaller items, the higher the shelving, the more dangerous they can become. Ergonomic strain isn’t just an office phenomenon. In the warehouse, it’s real and it’s painful. Primarily associated with back and foot injuries, the wear and tear a body sustains in the warehouse can put workers out of commission for days, months or, in extreme cases, indefinitely. Prevention: Ensuring your employees have first-hand knowledge and a sense of awareness is your first line of defence. Never ask your workers to push the limits of what they feel they’re capable of and retain an open door policy that invites feedback if ever they feel at risk of injury. Train everyone on the floor, including supervisors on proper lifting techniques.